For the 24 hours to 23:00 GMT, the USD declined 0.25% against the CAD and closed at 1.2986. The Bank of Canada (BoC), in its business outlook survey for the three months ended mid-September indicated strong growth in firms supported by domestic and foreign demand. Moreover, the central bank expects to raise the interest rate in the next policy rate decision. In economic news, Canada’s existing home sales unexpectedly slid 0.4% on a monthly basis in September, compared to an advance of 0.9% in the prior month. Market participants had envisaged existing home sales to remain unchanged. In the Asian session, at GMT0300, the pair is trading at 1.2993, with the USD trading 0.05% higher against the CAD from yesterday’s close. 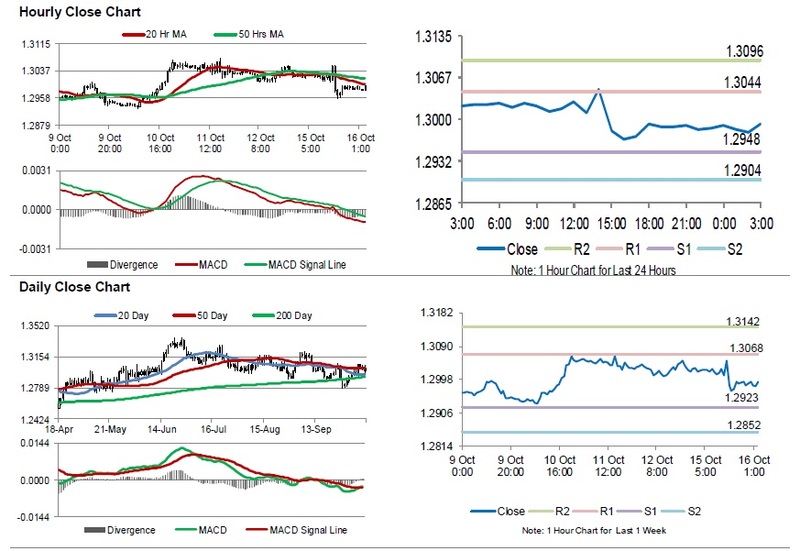 The pair is expected to find support at 1.2948, and a fall through could take it to the next support level of 1.2904. The pair is expected to find its first resistance at 1.3044, and a rise through could take it to the next resistance level of 1.3096.